This entry was posted in Recovery & Support and tagged Addiction, Coaching, Managing Symptoms, Treatment on September 21, 2016 by Team Addiction Hope. Recovering from drug or alcohol addiction is a delicate time for one’s mind and body. The beginning of a dependency-free life is usually what determines success, and for any addiction, the mind is a powerful tool either for or against healing. Recovering addicts must control the mental aspect of recovery while conquering the often physical manifestations of detoxification and withdrawal. Many recovering addicts have found that beginning a yoga program helps tame the mental and physical manifestations of substance dependency. The great part about yoga is that anyone can start it, regardless of athletic ability or body type. All elements of the practice begin at the starting point of the user, not at a point that would be inaccessible to some. Engaging in a practice that balances the body will also help balance the mind, which are crucial components of recovery from addiction. The practice of yoga is widely used across the globe, but the practice is Hindu in origin. Yoga was designed to not only help the physical condition of the body, but to also heal the spirit and mind. Thousands of people turn to this practice when healing from addiction, and there are many reasons why. Most people with substance abuse problems aren’t in ideal shape. Certain drugs cause weight gain, whereas others cause muscle loss. A long period of chemical imbalances will begin to show in users’ outward conditions. Yoga allows you to build new muscle, strengthen breathing and improve flexibility. One of the tenets of yoga is that your mind and your body are connected: What affects one affects the other. Routinely participating in yoga is a form of meditation. It can help make room for self-awareness, productive thoughts and a sense of relaxation. Practicing the holds of long yoga poses can release endorphins and dopamine into your body. These are the same chemicals with which drugs react to offer you a sense of enjoyment and happiness. You can find peace and euphoria through exercise without any ill effects on your mind and body. When in recovery, an idle mind can lead to relapse. Practicing yoga serves as a mental distraction to keep your mind from ruminating on old habits. What’s more, yoga can be done just about anywhere, and the only equipment you need is a willing mind and a ready body. Aside from offering a helpful distraction, yoga can give recovering addicts a sense of ambition. There are all sorts of styles and difficulties in the world of yoga. With diligence and dedication, one can always improve his or her technique and try new methods. Jumping into yoga gives recovering addicts something to challenge themselves with and look forward to accomplishing. It’s not uncommon for people to practice yoga for a while and then fall so in love with it that they want to become an instructor. Learning how to teach yoga can be an incredible way to give back to the community and maybe even help out other former addicts along the way. If you’re interested in adding yoga to your recovery program, there are many ways to try it. It’s generally recommended that beginners go to classes in person so the instructor can correct their form and technique. However, beginner videos are available on YouTube, and most libraries will have recordings to borrow as well. Practicing with others can be a step toward finding a new avenue for friendships with people who won’t encourage a relapse into substance abuse. 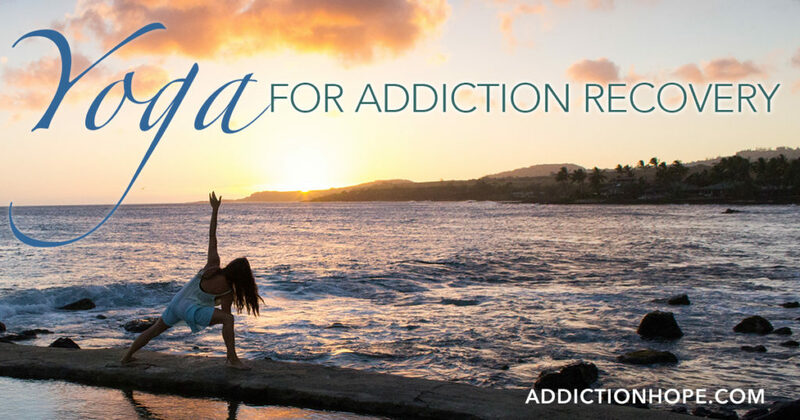 In many cities, there are classes and instructors who focus solely on yoga for addiction recovery. Though not a necessity, knowing that your fellow practitioners understand your struggles may be a boost for your recovery. Finally, if you’re looking for a specific treatment center that will help you overcome addiction, look for one that offers yoga as part of a holistic therapy program. Most treatment centers subscribe to this practice, so you should have little trouble finding such a place. Don’t hesitate to seek help sooner rather than later.